You will earn 2,439 Reward Points. Earn 1 reward point for every 1 dollar spent. 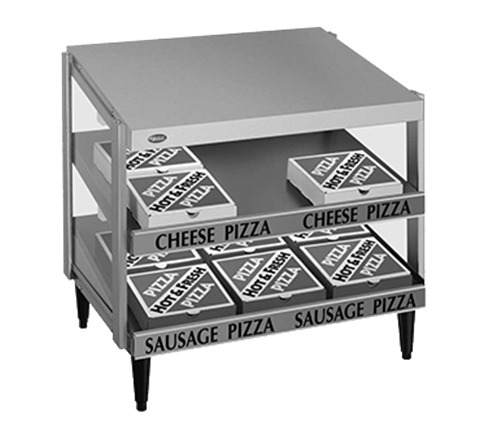 The Hatco Glo-Ray® Pizza Warmers are perfect for holding boxed or bagged pizza and other wrapped food product at any convenient self-serve or quick serve area. Choose from base heat only in single, dual, triple and quadruple shelf models, with any combination of three widths and two depths. All models are constructed of aluminum and stainless steel with tempered glass side panels (no glass side panels on single shelf models), hard coated aluminum shelves and 4" (102 mm) legs.